“Right Shoring” is the practice of weighing the business benefits for manufacturing in all locations, before making the decision to keep production in a foreign company. Factors such as, ROI, transportation costs, communication, wages, & NAFTA agreements all play important roles in the decision-making process, specifically after the global recession in 2008. Since then, wages and the price of oil have increased dramatically; Which, unfortunately for some small and medium size businesses who do not have the same bargaining clout of larger manufacturers, results in a decreasing ROI. Additionally, many manufacturers have seen a longer supply chain cycle, shortening their cash flow. While many global manufacturers are working to “re-shore” plants, others have been looking at the benefits of manufacturing in Mexico. Interests have peeked over the last year as the market reached a crossover point that made manufacturing in Mexico less costly than in China. What Are The Benefits of Manufacturing in Mexico? 1. Proximity: Mexico is contiguous to the United States border allowing for a shorter transit time for both inbound and outbound transportation. With the rising cost of fuel becoming a risk for global manufacturers, transportation cost is a decision making factor for manufacturers. Tijuana, for example, is a close drive to San Diego. With our plant in Tijuana and our warehouse in San Diego, Mexico manufacturing has been a huge advantage for our company. Furthermore, the time difference between Mexico and the United States is less than it is with Asia. This allows for faster communication. So, with a shorter supply chain, combined with faster communication, companies’ cash to cash cycle can be as short as 11 weeks. 2. Stable Workforce: The Mexican Government is eager to cater to the new demand for skilled workers. In an effort to support growth, Mexican workers have access to two or five year courses in manufacturing for little to no money. This investment in education allows the country to evolve its labor force while continuing to drive North American manufacturing growth. In Tijuana, there is a dense population providing little turnover for manufacturers. 3. Stable Wages: Historically, Mexico has had higher labor wages than China, and other low cost manufacturing countries. However, since 2000, the wages in China have risen by 500% and are forecasted to continue to increase as the value of the Yuan increases and workforce diminishes. In Mexico, it is a different story. Labor wages have, and are estimated to continue to, remain stable. 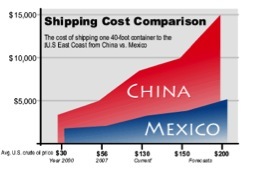 Combined with the growing skilled workers in Mexico, there is no shortage of supply. 4. Emerging Market Heavy Weight: Mexico has seen significant growth over the past five years. Its economic GDP was $1.761 trillion in 2012: larger than Canada ($1.513 trillion). The growth rate in Mexico was 3.9%%, faster than either the U.S. (2.2%) or Canada (1.8%). And, with 44 Free Trade Agreements through NAFTA, more than any other country, Mexico is projected to continue to prosper. 5. Intellectual Property Protection: The global economy is shifting to an information economy, which means intellectual property protection is more important than it has been in the past. Under NAFTA, Mexico provides protection, allowing companies to focus on innovation and research. At Tornik, the “right shore” for fifteen years has been Mexico. With lower transportation costs, stable workforces and stable wages, as well as, less barriers, Tornik has been able to provide customers with high quality products with less cost. With highly skilled engineers in both East Hartford and Tijuana Mexico, Tornik has the capabilities of handling custom assemblies ranging from low volume, high mix to high volume, or low mix orders. Cable and harness assemblies, electromechanical assemblies, turnkey box builds; Tornik and the EMS Mexico are your innovative EMS solution for any unique need.